Concordia Publishing House congratulates and rejoices with Dr. Christopher Brown on the occasion of his obtaining tenure at Boston University School of Theology. Dr. Brown, whose rank is now Associate Professor of Church History, serves as general editor for Luther’s Works: American Edition. Boston University is the fourth-largest private university in the United States, with approximately 33,000 students and 4000 faculty in eighteen schools. The Boston University School of Theology, the oldest school of the university, was founded by New England Methodists in 1839. Dr. Brown teaches Church History in the School of Theology, including a survey of the history of Christianity and specialized courses in Late Antiquity, the Middle Ages, and the Reformation. We recently interviewed Dr. Brown concerning his promotion and tenure. CPH: What must a professor do to “get tenure”? Christopher Brown: Tenure is based on a thorough review of a junior (assistant) professor's teaching, service to the university, and writing, especially publications. The university solicits external evaluations from ten to twenty senior scholars outside the university, and conducts its own reviews at five levels, from the department to the office of the university provost. CPH: What does receiving tenure mean for your career? Christopher Brown: Tenure means that a professor is recognized as an established, well-regarded, and productive member of his guild. It means that barring serious misconduct, a tenured professor will continue to be a member of the university until retirement. It guarantees freedom to work and publish without fear of being fired for articulating controversial or unpopular scholarly arguments. CPH: You have been invited to attend the International Luther Congress in Helsinki, Finland, this summer. On what will your presentation focus? 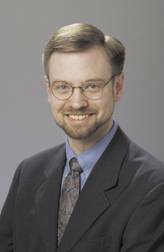 Christopher Brown: I will be leading a seminar on Reformation-era Lutheran hymnody and presenting briefly on the scholarly challenges and fruits of translating and editing Luther for the extended edition of Luther's Works. CPH: How have Luther scholars in the USA and internationally reacted to your new edition of Luther’s Works: American Edition? Christopher Brown: Scholars have been appreciative of the quality of the careful translations and the support provided by the annotations and introductions--both of which are a collective enterprise that I have been privileged to coordinate and guide. They are grateful to Concordia Publishing House for undertaking and supporting such an extensive work.